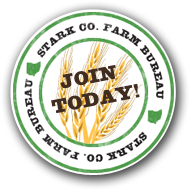 Stark County has 5,292 members and of those members 1,087 are farmers and the rest being non-farmers. The Stark County Farm Bureau is a non-profit entity that works on behalf of the farmers. We represent their interest at all levels of government as a voice for the farmer. We also do lots of promoting and educating the consumer about the importance of our farmers. We have lots of opportunities to building leadership and communication skills as well as having fun. The Stark County Farm Bureau puts on an annual drive it yourself farm tour each October. The intent of this event is to educate the public about what goes on at a farm. They also provide scholarships for area youth that are attending college in an agricultural field. The overall goal of the organization is to help the consumer better understand the practices that make up agriculture. We want to show the consumer how we do it and that we do it with their and our best interest at heart. We care for the food and animals we raise and take pride in offering a great locally grown product. Stark County raises: Vegetables, Fruit, Tree nuts, berries, nursery stock, sod, Christmas trees, hay, corn, soybeans, wheat, poultry, eggs, cattle, milk and other dairy products from cows, Hogs, Sheep, Goats, Horses, ponies, mules, donkeys, aquaculture(fish), pheasants and whitetail deer. Stark County ranks 9th in poultry and egg production, 3rd in the production of vegetables, melons, potatoes and sweet potatoes, and 10th in dairy production in Ohio.